Since April 2008 SAHA's Freedom of Information Programme (FOIP) has developed its Freedom of Information Project, Capacity Building in the Community-based sector (PAIA) to become one of the lead organisations in South Africa offering multi-level training and capacity building to organisations and individuals who can most benefit from using PAIA. The project aims to empower individuals and organisations from targeted sectors to understand and utilise the Promotion of Access to Information Act (PAIA) as a strategic advocacy tool. It gives effect to core aspects of recommendations set out in a 2007 SAHA-commissioned feasibility study. The pilot project focused on the gender-based violence and transitional justice sectors, working with Tshwaranang Legal Advocacy Centre (TLAC) and Khulumani Support Group respectively. In 2010 SAHA continued the project focussing on public participation, with Black Sash, and environmental justice, with groundWork, South Durban Community Environmental Alliance and the Vaal Environmental Justice Alliance. In 2011 SAHA worked with the lesbian, gay, bisexual transgender and intersex (LGBTI) sector, including African Men for Sexual Health Rights, Free Gender, Forum for the Empowerment of Women, Gay and Lesbian Memory in Action, Gender Dynamix, Inclusive and Affirming Ministries, Intersex South Africa, Lesbian and Gay Equality Project, OUT LGTB Well-Being, People Opposing Women Abuse and uSizo Lwanamuhla. 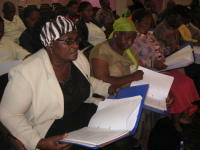 SAHA's unique program offers training (i) to individuals through a series of multiple workshops, (ii) shadow mentor programmes, (iii) setting up PAIA networks and (iv) at the organisational level to ensure the implementation of PAIA fits the existing structure of an organisation, or that structures be implemented or amended in order to accommodate PAIA. As such, FOIP makes a valuable contribution to democracy building in South Africa offering a bottom-up approach by empowering individuals and organisations to hold public and private bodies accountable, encouraging a more participatory democracy and digging at the very heart of a faceless bureaucratic state. PAIA Coordinators trained up through the PAIA Shadow Mentor Programme are welcomed to join the PAIA Civil Society Network. A number of products have been developed as part of this project; the PAIA Resource Kit, PAIA Workshop Guide; PAIA: Case Studies from Civil Society DVD and Guide; Accessing Information in the LGBTI Sector; and LGBTI and Access to Information in Africa. SAHA also provides short workshops introducing groups of individuals or organisations to the PAIA. If you are interested in learning more about these workshops or would like to request that SAHA provide an introductory workshop on PAIA for your organisation please contact the Freedom of Information Programme. The PAIA Resource Kit provides step by step instructions on how to complete the forms required to submit a PAIA request. The PAIA Workshop Guide is a comprehensive training manual for people wanting to learn how to use PAIA. The PAIA: Case Studies from Civil Society DVD and Guide is an interactive training tool which outlines the key issues around PAIA. The Accessing Information for Your Community guide summarises the legal right to information and highlights the important role that access to information can play in the achievement of your community's advocacy goals and the protection of your rights. The Accessing Information in the LGBTI Sector guide is designed to assist persons in the LGBTI sector to make requests under the Promotion of Access to Information Act. The LGBTI and Access to Information in Africa guide is designed to assist persons in the LGBTI sector in Africa to recognise the important role access to information can play in the achievement of their advocacy goals and the protection of their human rights. The PAIA CSN is committed to improving the implementation and usage of PAIA, raising awareness about the right amongst citizens, and working with bodies subject to the Act to improve understanding.